The output signal will rise at a rate determined by the UP control and the up control voltage input. The output signal will fall at a rate determined by the DOWN control and the down control voltage input. An additional output is available called NEG OUT. This output is a gate style signal that is 0V when off and +5V when activated. It will be activated when the main output falls below 600mV. This can be used as an 'end-of-cycle' output when the VRG is in one-shot mode. A bi-colour LED gives visual indication of the module's main output signal level. The various operating modes of the instrument are determined by the three way mode switch and use of the SLEW IN jack socket. Minimum frequency: 0.009Hz (one cycle per two minutes)  linear, 0.003Hz (one cycle per 5 minutes)  exponential. Output level: +5V to -5V. Output level: 0V to +5V. The one shot can be triggered to cycle endlessly up and down by connecting a patch lead from the NEG OUT socket to the GATE socket. The NEG OUT can be also used as a gate delay in the one shot mode. The issue 2 Oakley VRG behind a natural finish Scheaffer panel. Note the use of the Sock6 board to keep the socket wiring nice and tidy. 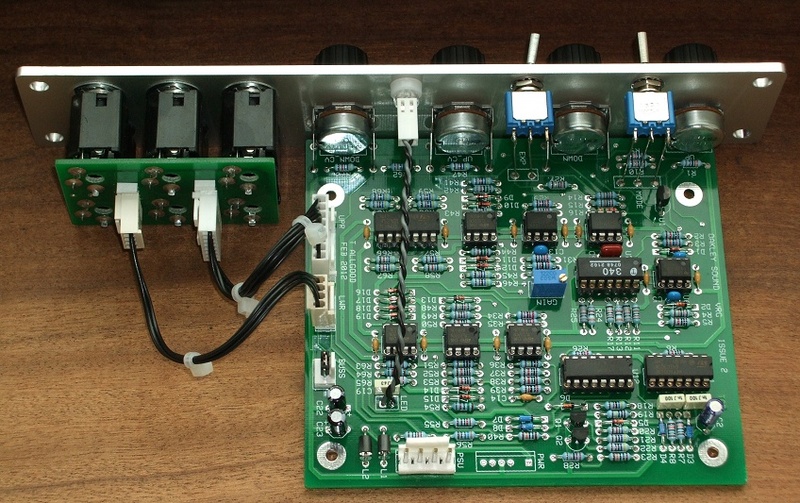 The module accommodates either our standard Oakley/MOTM power header or a Synthesizers.com power header. The current consumption is +44mA and -37mA. The board size is 109mm (deep) x 124mm (high). As with all Oakley projects both PCBs are double sided with through plated holes, have tough solder mask both sides, and have bold component legending for ease of construction. VRG ready made modules may be available from Krisp1.com. Last revised: May 02, 2018.